Give your managers better information about the people they manage so that they can be more effective. Learn how to develop talented employees. Employee development is not just the responsibility of the employee. In today’s diverse workforce, business practices have evolved to reflect economic competitiveness in developing and retaining talented employees. Organizations are continually seeking new solutions to assess, understand, and strategize employee development. One of the greatest challenges faced by managers is the strategic personal development of their employees in order to ensure effective use of their talent. To properly manage this vital resource, they must identify their challenges and then implement employee development and training for improvement. Profiles International’s employee development solutions will help managers effectively manage, motivate, and empower employees. Effective management requires insight about the core characteristics of individuals. 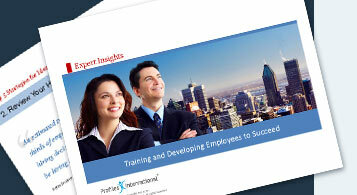 Profiles International provides invaluable tools for increasing consistency in managing employees. What makes Profiles International’s tools the leading tools in the industry is our exclusive PROFILES JOB FIT™ technology. Good management is all about understanding "fit" and how employees fit with their job, their manager, their team, and the organization. By understanding fit, managers have greater knowledge of how to effectively interact with and coach the individual employees they manage. PROFILES JOB FIT™ technology is the most advanced, state-of-the-art solution available today for measuring human potential and predicting job performance. Using PROFILES JOB FIT™ as a key part of your employee development solution, you will be able to uncover why some of your employees perform at extraordinary levels while others, who appear to be equally qualified, are only average performers. PROFILES JOB FIT™ is also valuable as a tool that predicts performance and behaviour. Profiles International’s employee development solutions provide a variety of reports to help measure an employee’s core characteristics and understand fit. Coaching reports, for example, are a manager’s guide to helping the people they manage develop better work habits. The report has specific suggestions for improving employee performance so it approaches the productivity of the company’s top performers. Using the reports to direct the development of employees enables managers to develop their leadership abilities. By including PROFILES JOB FIT™ technology as a key factor in your process for employee development, your managers will be significantly more effective.